CHRISTMAS WILL OFFICIALLY be kicked off tonight for the hundreds of thousands who will sit down to watch the Late Late Toy Show. Some 1.4 million viewers watched last year’s show from beginning to end, making it one of the most-watched programmes on Irish television. During a brief unveiling of the show to members of the media, host Ryan Tubridy revealed that the show will be taking inspiration from the Little Mermaid and he will be Sebastian. Tubridy said that he’s known Sebastian all his life as a lobster but when he looked it up “apparently he’s a crab”. Well I’m calling him a crabster. I will be a crabster Tubster thing and I’ve been practising my moves. Tubridy told reporters that he’s been singing and dancing around his kitchen in the mornings, practising his moves in between bites of Weetabix. This is Tubridy’s 9th Toy Show but he says he still gets nervous and that he’s been watching Elf for inspiration as the time gets closer. “Yea I’m always nervous about the show, even on a regular Friday night, but with this, this show gets a bit crazy because the interest in it is insane. “I’m giddy with excitement but I do realise there’s a weight of expectation and it’s about the kids, all I’m doing is facilitating the kids. It’s called the Toy Show but funnily enough I can’t remember one toy, you just remember the kids with the stories and the lines and all that stuff. Viewers are being warned not to miss the beginning of the programme as there’s “a tiny thing before the beginning of the credits”. There’s a tiny little sequence to watch out for that I quite like, nothing to do with me but it’s nice, it’s offbeat. Ryan revealed that while there will be lots of surprises during the show, no international stars will be appearing. “Very often we’ve had people like Ed Sheeran and Robbie Keane and you see these children and you think they’re going to faint and that’s been the case in the past. The Late Late presenter also addressed the situation of more than 3,000 children being homeless in Ireland, saying he finds it “preposterous and not acceptable in 2017″. While he couldn’t go into specific details to protect the children, he said that homeless children will feature on tonight’s show. Homeless children will feature but we won’t be telling you this child is and that child is this, that and the other. “Yes it’s fun, yes there are toys, yes Christmas is magic but it should not be the case that there are children watching the Toy Show in a room on a hotel bed with three other family members and that has to get up the next morning and walk past a bunch of guys who are still drinking from the night before. That’s not good and we have a responsibility to talk about that. 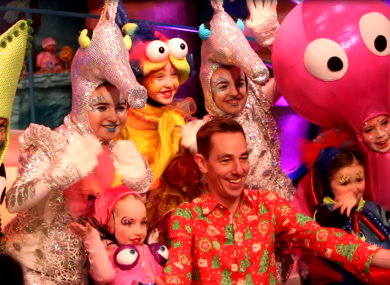 Email “Tubridy has been getting 'Toy Show ready' by watching Elf and dancing around his kitchen”. Feedback on “Tubridy has been getting 'Toy Show ready' by watching Elf and dancing around his kitchen”.